Following my examination of Jennifer Pastor's work, I was inspired to try some expressive drawings using nib pens where I can create a variety of thin and thick lines. Joseph Gillot Manga Nibs. These were fine but not great. Zebra Comic G. The nib was constantly running out of ink after just one stroke which made using them frustrating. Kuretake Zig Cartoonist Ink Dip Pen Holder and Nib Set. This is an excellent set - very comfortable holder and the nibs draw beautifully. Tachikawa Comic T-44 Nihonji Pen Nib. This set was very similar to the Zig and likely is produced by the same manufacturer. These nibs were recommended to me by a friend illustrator and they did not disappoint. Indeed they were the best I tested. The nib creates easily thin and thick lines and draws for a long time without running out of ink. Figure 1. Botanical Sketchbook Studies, 2017. Draft pencil, ink and various Zig dip pen nibs on paper. Figure 2. Butterfly Sketchbook Studies, 2017. Draft pencil, Ink, Zig Dip Pen and synthetic brush on paper. Figure 3. 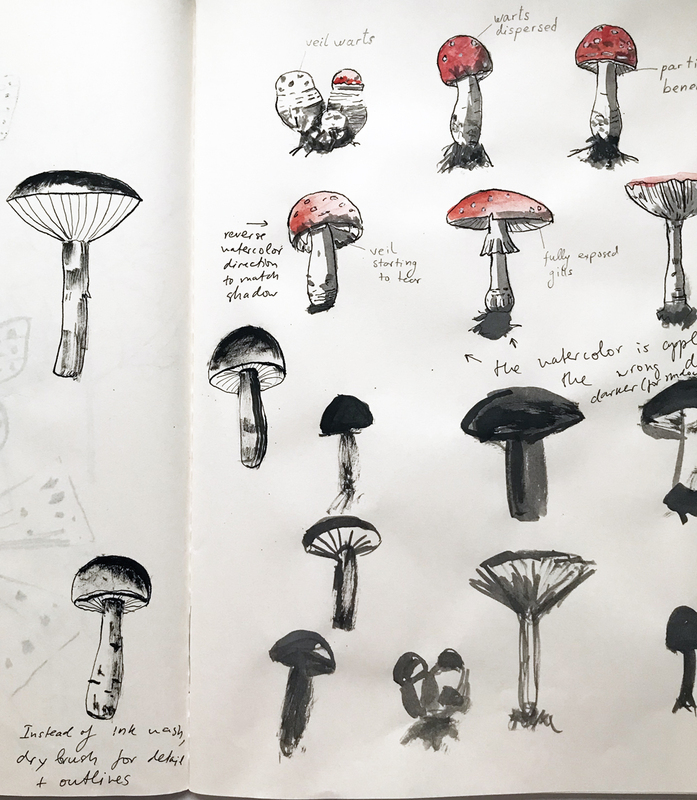 Mushroom Sketchbook Studies, 2017. Draft pencil, ink, watercolor, Tachikawa dip pen and synthetic brush on paper. While I enjoyed the clean and simple outline drawings made with the nib pens (Figure 1), I also wanted to experiment and contrast those with some ink brushwork (Figure 2 and 3). I find the combination of a dry and wet brush to result in some expressive and less fussy images which are not typical for me and therefore challenging. Finally, mixing the precision of the nib pen lines with dry brush marks led to the most interesting results in my view (Figure 3, bottom left corner). I enjoyed the process which started with the inspiration from Jennifer Pastor's diagrammatical drawings and developed it further by experimenting with different tools. I also like adding some annotations to my drawings, similar to the way she has labeled parts of her images. While in her case, these annotations seem to resemble scientific notes and have underlying irony, in my drawings they are factual information.